What’s the world’s best grill? In the U.S. the debate usually circles around charcoal versus gas. But as you travel around Planet Barbecue, you find a stunning array of wood burning grills. This week’s blog post—written by Paula Marcoux—focuses on a grill that enjoys cult status in Germany, but is virtually unknown elsewhere: a unique hanging grill called the schwenker. 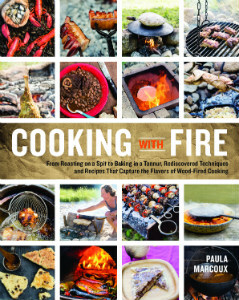 As for Paula, the culinary historian and former Colonial food ways manager at the Plimoth Plantation living museum in Massachusetts, she’s written one of the best books ever on live fire cooking on grills around the world: Cooking with Fire (Storey, 2014). It’s one of the most consulted books in my library, and if you don’t already own it, click here to buy it now. 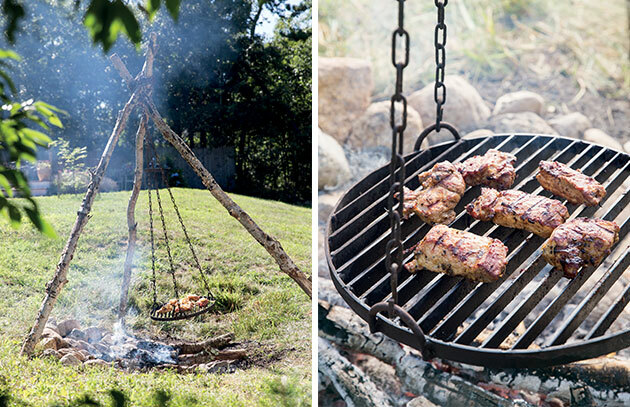 Cooks in the Saarland region of southern Germany use a grill called a schwenker—a heavy-gauge grill with three lug handles welded to the rim that allow it to hang from a tripod or gallows. Its traditional use centers on one particular dish, schwenkbraten, marinated pork sirloin steaks, but we have found it to be very adaptable and a wonderful all-around grill with remarkable low-and-slow capabilities. Typically the schwenkermeister keeps the thing moving—swinging and rotating from its chains—which, along with the ease of adjusting the grill’s height from the coals, makes it simple to cook items which are usually a bit of a challenge because of size and shape. Cooking such foods, like large whole chickens and small roasts, on the schwenker is a long, but leisurely process, feeling rather like making real barbeque. And the results carry some of the weight of real barbeque in smoke and juiciness. Get the recipe for Saarländischer Schwenkbraten (pork grilled on the schwenker).